This edible Optimus Prime is made of 700-800 individual pieces of gingerbread. And it doesn't just look impressive—it also won its maker, artist Caroline Eriksson, a huge cash prize. 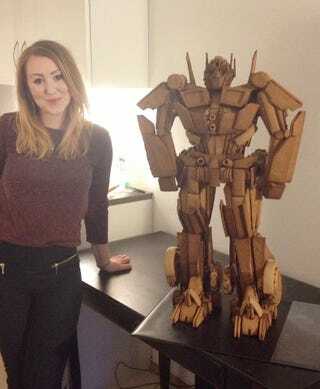 redditor downvotedagain posted Eriksson's sweet Transformer, explaining the 3D and compositing artist is a friend of a friend and that she was entering Optimus Prime—which took a week and a half of full-time work to build—in a gingerbread contest. Later, he posted that she took home the 40,000 NOK (roughly $6,500 USD) grand prize. You can watch her post-victory television appearance, alongside her towering gingerbread sculpture.